Advantages of MPLS: an example. While MPLS is already explained on this blog, I often still get questions regarding the advantages over normal routing. A clear example I’ve also already discussed, but besides VRF awareness and routing of overlapping IP ranges, there’s also the advantage of reduced resources required (and thus scalability). Given the above design: two routers connecting towards ISPs using eBGP sessions. These in turn connect to two enterprise routers, and those two enterprise routers connect towards two backend routers closer to (or in) the network core. All routers run a dynamic routing protocol (e.g. OSPF) and see each other and their loopbacks. However, the two middle routers in the design don’t have the resources to run a full BGP table so the WAN edge routers have iBGP sessions with the backend routers near the network core. If you configure this as described and don’t add any additional configuration, this design will not work. The iBGP sessions will come up and exchange routes, but those routes will list the WAN edge router as the next hop. Since this next hop is not on a directly connected subnet to the backend routers, the received routes will not be installed in the routing table. The enterprise routers would not have any idea what to do with the packets anyway. Update January 17th, 2014: the real reason a route will not be installed in the routing table is the iBGP synchronisation feature, which requires the IGP to have learned the BGP routes through redistribution before using the route. Still, synchronisation can be turned off and the two enterprise routers would drop the packets they receive. Just propagating a default route of course, but since the WAN edge routers are not directly connected to each other and do not have an iBGP session, this makes the eBGP sessions useless. Some flows will go through one router, some through the other. This is not related to the best AS path, but to the internal (OSPF) routing. Tunneling over the middle enterprise routers, e.g. GRE tunnels from the WAN edge routers towards the backend routers. Will work but requires multiple tunnels with little scalability and more complex troubleshooting. Replacing the middle enterprise routers by switches so it becomes layer 2 and the WAN edge and backend routers have a directly connected subnet. Again this will work but requires design changes and introduces an extra level of troubleshooting (spanning tree). So what if MPLS is added to the mix? By adding MPLS to these 6 routers (‘mpls ip’ on the interfaces and you’re set), LDP sessions will form… After which the backend routers will install all BGP routes in their routing tables! The reason? 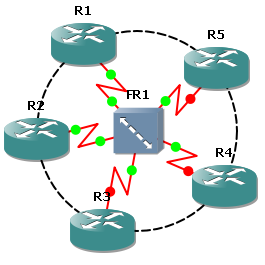 LDP will advertise a label for each prefix in the internal network (check with ‘show mpls ldp bindings’) and a label will be learned for the interfaces (loopback) of the WAN edge routers… After which the backend routers know they just have to send the packets towards the enterprise routers with the corresponding MPLS label. And the enterprise routers? They have MPLS enabled on all interfaces and no longer use the routing table or FIB (Forwarding Information Base) for forwarding, but the LFIB (Label Forwarding Information Base). Since all packets received from the backend routers have a label which corresponds to the loopback of one of the WAN edge routers, they will forward the packet based on the label. Result: the middle enterprise routers do not need to learn any external routes. This design is scalable and flexible, just adding a new router and configuring OSPF and MPLS will make it work. Since a full BGP table these days is well over 450,000 routes, the enterprise routers do not need to check a huge routing table for each packet which decreases resource usage (memory, CPU) and decreases latency and jitter. QoS part VIII: serialization delay and slow WAN links. In Europe, the cheapest WAN links start around 2 Mbps these days. While this makes some WAN optimizations covered in Cisco’s QoS guides unnecessary, it’s good to know them and the effects of slower links on traffic. This means that if you have a 1514 bytes frame (standard MTU of 1500 bytes plus the layer 2 header of 14 bytes) and send it out of a 100 Mbps interface it will take (1,500*8)/(10^8)= 0.12 ms or 121 µs. If a small voice frame arrives in the egress queue of a switch or router it can incur op to 121 µs of additional latency if a 1514 bytes frame is just being sent out. Consequence: even under near perfect conditions and good QoS configuration where voice frames are given absolute priority over the network, there’s a possible jitter per hop. The higher the general bandwidth throughout the network, the lower the jitter, so latency-sensitive traffic does benefit from high bandwidth and fewer hops. Over a 10 GE interface that same frame would be serialized in just 1.21 µs per hop. There are some consequences for WAN links: at slower speeds, the serialization delay increases rapidly. At 2 Mbps for a 1514 byte frame it’s 6 ms. At 64 kbps, it’s 190 ms. And in case you’re enabling jumbo frames: 9014 bytes over 10 Mbps is 7.2 ms.
Generally, at 768 kbps and below, jitter for voice becomes unacceptable. This is where Link Fragmentation and Interleaving (LFI). It works by splitting up large frames into smaller parts and putting low-latency packets between these parts. First, create a Multilink interface. It will serve as an overlay for the actual physical interface, as this is where the LFI will be configured on. The Multilink interface will have all configuration: IP address, service policies,… Except for the layer 1 configuration (notice the clock rate command on the serial interface). The ‘ppp multilink interleave’ activates LFI. The ‘ppp multilink fragment delay 3’ means LFI will automatically try to split up large packets so no packet has to wait longer than 3 ms while another is serialized. On the serial interface, encapsulation has to be set to ppp first. Next, it becomes possible to associate the interface with a Multilink overlay interface using the ‘ppp multilink group’ command. The configuration has to be done on both sides of the WAN link, of course. The other side needs to use PPP encapsulation as well, and needs to have LFI enabled to reassemble to split up packets. This concludes the series of QoS articles on this blog. Up next, I’ll try out different attacks on a Catalyst switch and see how it reacts. Ethernet Virtual Circuits on Metro Ethernet switches. Using MPLS on the WAN is a great way for multi-customer WAN connectivity, but so far it’s all layer 3. Layer 2 technologies like Ethernet over MPLS (EoMPLS) exist, but I have little experience with it so far, so I’m not covering it (yet). Instead, something else: layer 2 WAN services. Let’s assume you need to transport layer 2 VLANs from multiple customers over WAN links. Using a dedicated line per customer makes configuration easy, but it’s not cost-efficient. Instead, you want to use a mesh of switches that transport the customer data. The concept is simple enough, but it has some practical limitations: you can’t have overlapping VLAN numbers between customers. This is where Metro Ethernet switches step into the picture. In particular, I had the chance to work with a ME-3600X-24CX-M switch, and it’s something entirely different from a Catalyst switch. The difference is that this switch is made for MAN and WAN networks: it can run MPLS, supports VRF and has support for Ethernet Virtual Circuits (EVC). As said before, ‘switchport trunk allowed vlan none’ activates EVC. ‘service instance number ethernet’ defines a policy, matching on 802.1q headers. The ‘encapsulation dot1q 100-200’ makes that this service instance will be applied to all incoming frames with an 802.1q header between 100 and 200. ‘bridge-domain 5010’ places these frames in a bridge domain. A bridge domain is like a VLAN, but it doesn’t use tags. All frames of the service instance are put in bridge domain 5010. All frames of the service instance on the next port are put in bridge-domain 5020. This way, even if there are overlapping VLANs, the differing bridge-domains keep them separated inside the switch. ‘encapsulation default’ means anything not defined before. If it is the only service instance on the link, as in this case, it means every incoming frame. Both instances refer to different bridge-domains, keeping the separation per customer. ‘rewrite ingress tag pop 1’ means incoming frames will have their outer 802.1q tag removed. Finally, the ‘symmetric’ keyword means that outgoing frames will have an 802.1q tag added: the one defined in the service instance. This means the following: a frame entering from G0/1 will have a second 802.1q applied, VLAN 10, if it goes over the WAN link. Same for G0/2 towards the WAN link, only with VLAN 20. This means that if both customers send a frame with VLAN 100, the G0/1 frame will be sent out of G0/3 with inner 802.1q header 100 and outer header 10. The G0/2 frame will have inner header 100 also, but outer header 20. Separation between both customers is ensured, even with overlapping VLANs! A remote Metro switch on the other end of the link can use similar service instances again to remove the outer header and place each frame in its own bridge-domain. This configuration translates frames incoming on G0/4, VLAN 30, to frames tagged as VLAN 60 on G0/5. Again, the ‘symmetric’ keyword makes it work in both directions. As you can see, both 802.1q headers will be stripped off and the frame is placed in bridge-domain 50. This way it reaches VLAN interface 50. Other customers can’t reach this VLAN interface because they’re not part of the same bridge-domain. Cisco support forums has a nice document explaining the concept, also together with MPLS. Be sure to check it out if you want to know more! Multi Protocol Label Switching. Plenty of sites to explain it, yet I feel it’s something to cover on my blog, it just wouldn’t be complete without it. What is it? In the most simple form: it’s the use of labels, inserted on frames between layer 2 and 3, and use those labels to make forwarding decisions instead of the original layer 3 header. Why is it done? Well, in the late 1990’s switching in hardware was possible, but routing (layer 3 forwarding) in hardware wasn’t. By using labels as a layer 3 IP header replacement, these labels could be used in more efficient forwarding tables, and eventually also in hardware. This meant lower latency in routed networks. So that’s why up until this day, it is still discussed whether MPLS is a layer 2.5 or layer 3 protocol. I’m not going to make a judgement on that: by the standards it’s a layer 3 protocol (it’s above the layer 2 header, and ip-in-ip and gre over ip are not called layer 2.5 or 3.5), but on the other hand, the original use is to replace the use of the actual layer 3 header in forwarding, so 2.5 is logical in that regard. But the labels by themselves aren’t enough. Each label represents a destination: in a basic environment, an IPv4 destination subnet. To know which label is needed for which destination, each MPLS router needs to know the possible destinations so it can assign a label to it: it needs a routing protocol. Generally speaking, it’s a better move to choose a routing protocol with awareness of the topology, so a link state protocol like OSPF or IS-IS. Once the routers know all routes and have set up TCP sessions for LDP, they can agree on which labels to use the reach a certain destination subnet. If the first router in the above picture receives a normal IPv4 packet, it sees in the forwarding table (the Forwarding Information Base, or FIB) that the next destination is out of a MPLS enabled interface, with a label value of 33 appended to it. If the second router receives a MPLS packet with label value 33, it can do a quick lookup using it’s Label Forwarding Information Base (LFIB) and find a next hop out of another interface with a new label value. This process continues until it reaches the last router of the MPLS region, where the LFIB next hop points to an interface without MPLS. The MPLS header is removed and the packet is forwarded as usual. The above explains basic MPLS functionality. But it’s not everything: labels can stack, allowing for more complex configurations. In the next part, I’ll explain the use of multiple labels to create VRF-aware forwarding. Frame Relay is a topic that is widely discussed inside the Cisco certifications, as you encounter it in both the CCNA and CCNP topics. Outside of that, however, I still have to see the first real-world Frame Relay circuit still in use, as MPLS is a more commonly used WAN technology these days. Since Cisco routers have the command ‘frame-relay reverse-arp’ activated by default, all routers find out the layer 3 address (IP) on each PVC (layer 2). R1 can ping every router, the others can ping R1 but not each other. So far so good, now we configure EIGRP on all routers. We also configure a loopback interface that will be advertised: 10.0.1.1/24 on R1, 10.0.2.1/24 on R2, and so on. Adjacencies from quickly, and R1 can see all routes now. But the four spoke routers can’t see each others routes. No problem, just disable the split-horizon rule of EIGRP on the hub router, so that received updates will be send out of the serial interface again to the others. After a graceful EIGRP restart, all spoke routers can see all routes. But despite this, a spoke router still can’t reach another spoke router’s loopback. Why not? Well, because the spoke routers have no idea how to get there. The frame-relay reverse-arp mentioned earlier finds out what’s at the other side of a PVC link, but it does not go further than that. Unable to gather the correct ARP information, packets will be dropped. To make it possible, you will need to add static mappings to the spoke routers. The PVC used is of course the only PVC possible on a spoke router. Since the next hop defined in the routering protocol is now reachable, the spoke routers can ping each other’s loopbacks. Packets will be send to the hub router first, who will then relay these packets back out of the serial interface to another PVC. The single point of failure is the central hub, since everything depends on it. In OSPF it’s the same: you will need to add these static mappings to make the actual forwarding work. The configuration of OSPF itself is different, as OSPF has no concept of split-horizon (that’s for distance vector protocols, not link-state). I personally prefer configuring the serial interface as broadcast, allowing for automatic neighbor discovery, and set the hub router as DR (router-id, and configured as first). The layer 2 topology now reflects the DR situation: a spoke router will send a link-state advertisement to the hub router (the only PVC), and the hub router send out a multicast to all spoke with the necessary information. I hope that this is an informative post to those who want to better understand Frame Relay partial mesh.